Sliding doors were mostly seen in Japanese and Chinese houses but their popularity has increased greatly in recent times. These types of doors slide across the wall and do not need any swinging space like conventional doors. No matter how heavy snow has fallen, sliding barn doors can easily be opened. You can even partially open these doors and slip smaller objects into the barn easily. An ideal sliding door needs to be light weighted for easy opening. You can build a sliding barn door according to your need and convenience. For installing a sliding barn door, you need to construct its frame first. Keep in mind that a door frame has to bear the entire weight of the door; hence, it has to be strong and durable. You can use 2-by-4 inch wooden boards to make the door frame. Double stacking the wooden board or using a 4-by-4 inch beam can add further strength to your door frame. Cut the wooden board to the height and width of the barn door accordingly. Try to cut as straight as possible, as an irregularly cut frame will not look pretty. You will need metal braces and galvanised nails to assemble the wooden frame. Cut cross brace and install it in the centre of the wooden frame. Larger door frames may require diagonal cross braces to bear more pressure. Next comes the process to build the actual door. 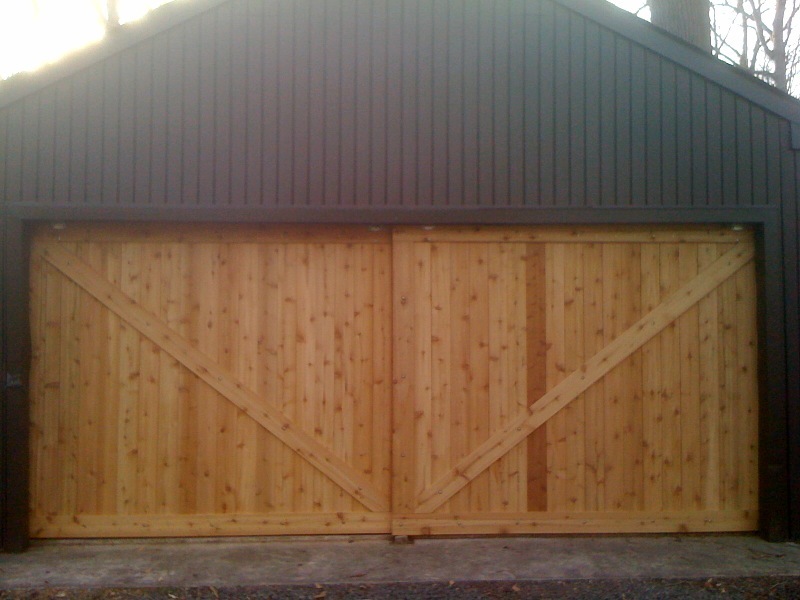 You have to cut the wooden planks to the height of the barn door and place them on the frame you constructed. Use the galvanised nails or screws to fix the planks to the door frame. It will be better to use any adhesive or wooden glue to increase the strength of the door. Now mount the sliding door track on top of the wooden frame you constructed by using a carpenter’s level to ensure it is not placed unevenly. Wooden screws and a power driver will be needed to fix the door track firmly to the frame. Mount three to four track wheels at the bottom of the door, as these wheels are necessary if you want your barn door to be opened with minimum force applied. Once you have measured the mounted track distance, you can install the similar door tracks to the walls of the barn wall and assemble the door into the wall.